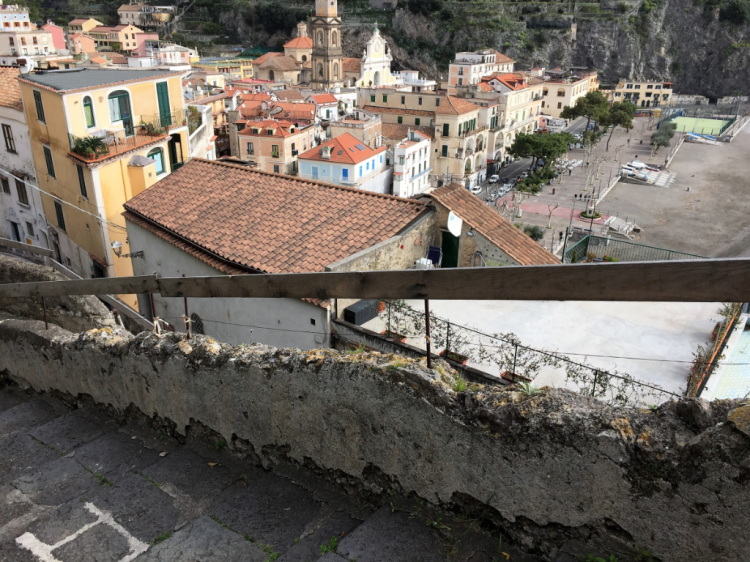 MINORI, ITALY-A week into our off-season trip to the ancient Amalfi Coast beach town of Minori, my wife and I heard whispers from a doorstep as we walked along a cobbled lane. Our stay in Minori followed a cool but sunny one-week February cruise on Viking Ocean’s Viking Star from Barcelona to Rome. The ship stopped in ports with access to Mediterranean cities that were alive with shopping and winter activities, while some of the major attractions were in near hibernation. During the crowded summer season, for instance, you never could tour Florence and revel in the joy of nearly empty museums. Planning a two-week sojourn after our cruise, we had spent evenings on the Internet at home looking for an inexpensive apartment within a two-hour rental car drive south of Rome. We wanted enough space for working on our laptops and cooking in a modern kitchen; a moderate climate in a location from which we could do daily walks with views; a village for buying fresh produce; and attractions within an hour’s drive for day tours and/or a special lunch. 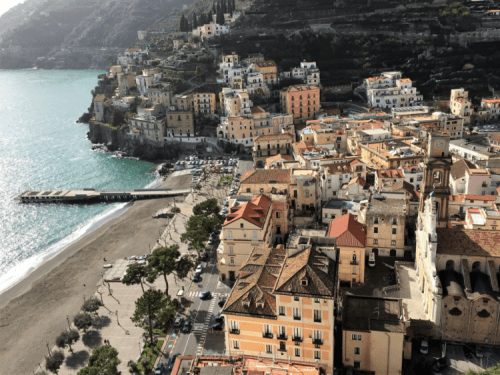 Research kept pointing at coastal towns facing south on the Amalfi peninsula, spread out along the tight, twisting road from Salerno west to Positano. Days in winter are in the 50s and 60s, and nights seldom fall below 40 degrees. We found about a dozen possible accommodations, then whittled down the towns by reading magazine and newspaper travel articles, as well as customer reviews on websites including Trip Advisor, Airbnb, and Booking.com, all of which we had used before to book accommodations. Minori just seemed like our kind of town. It sits directly on the sea, surrounded on the other three sides by terraced vegetable plantings, vineyards and lemon groves. Within a few blocks are a small downtown with choices of fresh produce shops, three restaurants with good reviews online, Roman ruins for exploring, and the beginning of steps and trails for walks up into the countryside. 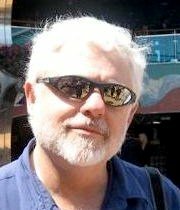 We used Booking.com to rent a two-bedroom apartment in a building called Braschi (AmalfiDreams.com) for less than $100 a night, including taxes, essentials such as towels, linens and Wifi, and extras such as a dishwasher, a small washer/dryer, and the freedom of 30 days before our arrival to cancel. We were willing to trade access to an elevator, walking 75 steps inside the building to the third floor, in return for the view of the sea from a window in our combined living and dining room. We ate many meals in our comfy quarters. What we didn’t know about living in Italy, we Googled. We learned to make espresso from a simple pot not much bigger than a coffee mug. We learned how to sauté a bunch of little crustaceans that were fun to try, but we never went back for more. The key, said Google, was olive oil with lots of garlic and lemon. Next time, we decided, we needed a bigger fish. 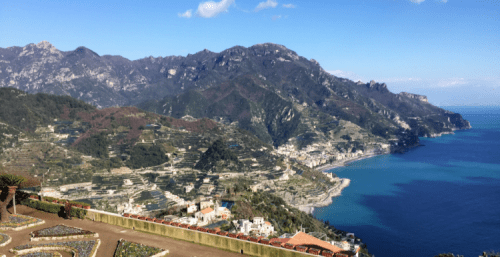 The hills around us were alive with lemons and grapes, which provided a backdrop for our greatest accomplishment, a walk to Ravello, known for its summer theater and great mountaintop views. 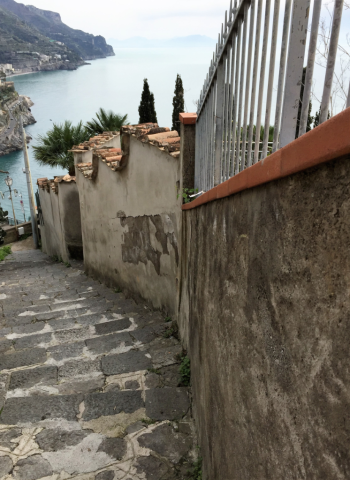 Local guidebooks say that travelers have three choices to climb to Ravello from Minori. Two are motorized: Driving is about five miles of stops, twists, and turns estimated to take about 20 minutes, which would mean an average speed of 15 miles per hour. Riding on the local bus, which leaves each hour during the day, takes 36 minutes. The road is treacherous. Traveling on footpaths is much shorter, less than two miles town to town, but the route comes with 1,500 steps. The ascent to Ravello is estimated by locals at 49 minutes. We were satisfied to arrive at the Ravello town square in one hour, 20 minutes, stopping about every 100 steps to catch our breaths and admire the magnificent views. 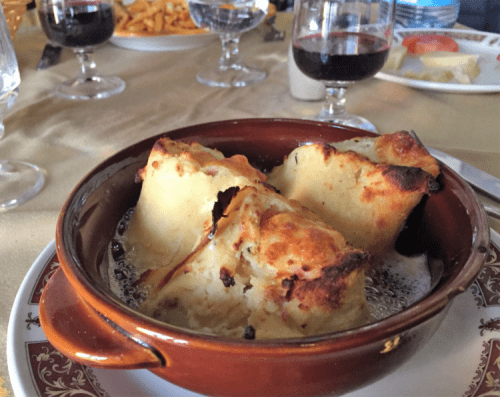 At the top, our rewards included Trattoria Da Cumpa’ Cosimo, where Netta, the longtime owner, stopped at our little table to recommend a lunch menu of outstanding pasta, including my wife’s first crespolini. When Netta learned we had walked from Minori, she said she wished she could trade places with us. At last count, the restaurant had 176 reviews online, a large majority of them very positive but others that complained of the lack of a written bill of charges, prices that seemed high, and an attitude of disdain for customer complaints. We added ours to the positive reviews. Netta was one of many merchants whom we remember fondly.
? 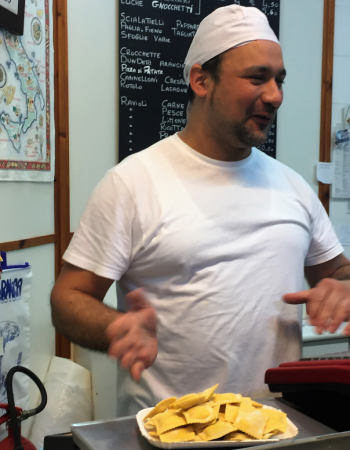 A pasta maker at Minori’s Il Pastaio who graciously showed us his kitchen and suggested we return the next morning for the day’s special, which he carefully packaged with butter in a container that we could pop right into the oven.
? A woman in one of the tiny grocery shops who, after I picked out a bottle of local wine, shook her head slightly and handed me a different bottle. An extra euro in price, but much better, she said.
? 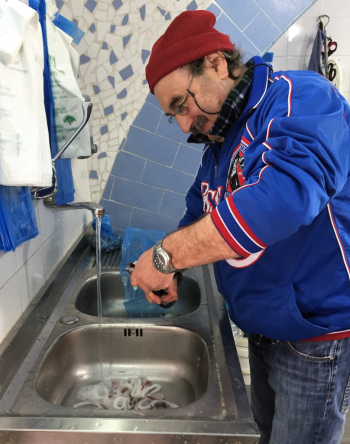 A young man in the butcher shop who remembered, on our second visit, to switch the ham in the meat slicer for a better cut of prosciutto, which was a little more expensive than what many residents may have been willing to pay.
? The fish monger, who stood outside late one afternoon, across the street from the police station. He watched us pass by, then gained our attention with a “Psssst” when we returned. We followed, as he directed us to his unmarked, out-of-sight collection of fresh fish for sale. He cleaned and cut calamari so it was ready to cook for dinner in the olive oil, garlic and lemon that remained from a previous meal. Off-season Minori was such a gold mine of smiles and gentle people that given another two weeks to relax in Italy, we would return. The Internet is full of ideas for accommodations on the Amalfi Coast, which also has plenty of restaurants, though some are closed in winter. Unless you plan to bus in and out, or hire a driver, your most difficult decision may be in renting a car. The Amalfi drive can be hair-raising, and your poking along will not be appreciated (pull over whenever there are three cars behind you). If, however, you enjoy such driving, especially in a car with a clutch, you are in for a treat. We had no difficulty. We bought a transfer from our cruise ship docked in Rome’s port of Civitavecchia to the Rome airport, where we rented a sporty Peugeot for two weeks, using all the gears and returning it unscathed.